spent all day home with the dogs today, i didn't want to leave them since we were gone for so long yesterday! we trimmed their nails... i will never cease to be amazed at how fast Jasper's nails grow! he really hates getting it done, but at least he behaved pretty well today... even though Mama Pawlish wasn't there to give him treaties. i can't believe she's still in Virginia, i have no idea when she'll get to come home. my other big productive moment of the day was conditioning and oiling my new bridle and Mr. Pawlish's wallet. the spine of his wallet is so dry, it's been needing conditioning for years! today's polish is Julep Mackenzie. 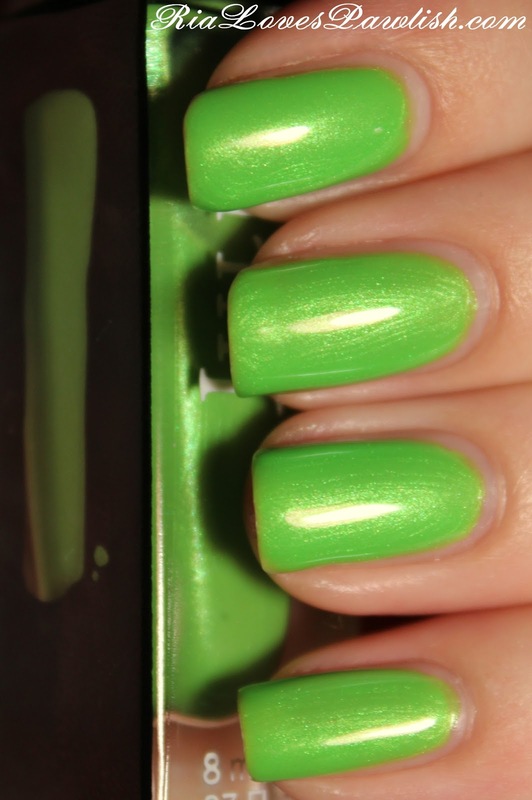 it's a saturated green apple color with a pearlescent white shimmer running through it. you can see a few brushstrokes, but they're not too bad. i used two coats and got pretty good opacity, you can only see the nail lines if you look really closely at the right angle! i think it would have completely opaque with another coat. the strange thing with this polish is i swear it actually smells like green apple! if you have this polish, tell me if you think it smells like that, too :) a coat of topcoat will really help it dry and add a nice shine! two coats Mackenzie, one coat Seche Vite. It's not just this color. I recently got my hands on several of these including Courtney and Madison and they both smelled like green apple as well.